LILONGWE, Malawi, December 23, 2013 (ENS) – Wire snares and traps set by poachers have cost the Malawian Department of National Parks and Wildlife three of the Critically Endangered Black Rhinoceros that were re-introduced 20 years ago after the species was declared extinct in Malawi. She died from the results of the gin trap snare, a steel spring trap which severed off her foot. The death was most likely from loss of blood or thirst from her inability to get to water – a slow and very painful death estimated to have occurred around the end of July or early August 2013. The trap and her horns were found intact at her final resting place, said Palmer, a passionate wildlife conservationist, in an obituary to Justerini. Another Black Rhino named Ultima, a very young unsexed rhino calf, was found in April 2012 after the rainy season in a decomposed state. A snare wire was found with the carcass at the scene. The horns were missing as was the meat. In 1998 the second breeding pair of black rhinos, namely Bentley and Julia, was brought to Liwonde from the Kruger National Park. Bentley became the dominant male in the sanctuary in 2000 after the natural death of the original bull, and he sired several calves between 2000 and 2012. In September 2012 a monitoring patrol found him strangled with a wire snare around his throat, lying dead in a small stream. 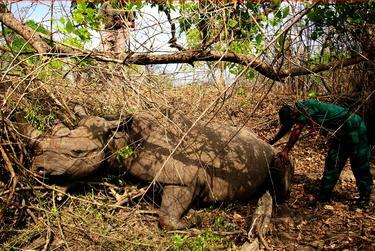 He had been dead for only one hour, and his horns were recovered before poachers got to him. An ambush was set up but the poachers did not return to the scene of the crime, Palmer said. When asked for reaction, Brighton Kumchedwa, Malawi’s director of parks and wildlife, confirmed the loss and said it was indeed sad the country was losing rare and endangered species in such a manner after huge monetary investments made. “We are working around the clock with our partners like the Central Africa Wilderness Safaris and other concerned individuals, so that we fight poachers head on,” said Kumchedwa. However Paul Taylor, who chairs the Wildlife and Environmental Society of Malawi, Blantyre branch, told ENS that poaching of wildlife, including the rhino, is indicative of the almost complete breakdown of law enforcement in Liwonde National Park, which includes the high security rhino sanctuary. “There is irrefutable evidence of corruption amongst wildlife personnel in collusion with the local police,” Taylor told ENS. The Department of National Parks and Wildlife’s failure to erect a perimeter electric fence in Liwonde National Park comes at a time when a major financial scam has rocked the Malawian government. Millions of dollars have been looted through bogus transfers to firms that provided no services to the government. The Ministry of Tourism, Wildlife and Culture, under which the wildlife department falls, is implicated in the “cashgate” scam for overspending its budgetary allocation for the current fiscal year through funds pilferage by senior staffers. 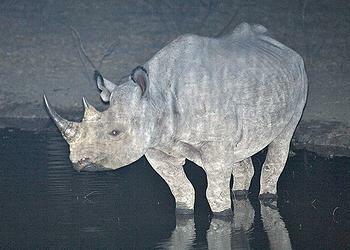 Yet, it could not provide resources to erect a perimeter fence for the rare black rhinos. To date, Malawi’s donors through the Common Approach to Budgetary Support have suspended aid worth US$150 million. The donors, which include the governments of the UK and Norway, the African Development Bank and the European Commission, are calling for investigations to bring all the culprits to book. They have also demanded explanations of how such huge sums of money found their way to firms and public servants. Throughout most of the 20th century, the Black Rhino was the most numerous of the world’s rhino species, which at one stage could have numbered around 850,000, according to the authoritative IUCN Red List of Threatened Species. Relentless hunting of the species and clearing of land for settlement and agriculture reduced numbers and by 1960 only an estimated 100,000 remained. Between 1960 and 1995, large-scale poaching caused a 98 percent collapse in numbers. By December 2010 the Black Rhino population across Africa numbered just 4,880 animals.